If the City of Los Angeles were run by gardeners we'd have a long term plan for survival, municipal departments would learn to share, we'd spend less money getting rid of water and we'd be a lot closer to becoming America's greenest big city. As the City of LA prepares to levy a 380% plot rental fee increase on its community gardeners, it's worth taking a look at our subtle urban farming ecosystem and considering the contrast in behavior between short sighted bureaucrats and gardeners with a vision beyond the harvest. Silver Lake Farms touts the success of their long term vision, one that results in soil that needs no digging. Companion plants, crop rotation, composting, and other long term commitments to the soil, not just the immediate harvest, are all behavior that could inspire City Hall. Imagine if LA's departments worked together, looking for efficiencies, committed to the long-term, evaluating success based on the impact to the community, not just the short-term harvest. The Holy Nativity Church in Westchester has a garden that grows food for churchmembers and the homeless, but most importantly, it is tended cooperatively and is maintained as a teaching garden to share the skills of how to grow food. Imagine if City Hall looked for opportunities to encourage and inspire community members, not frustrate and interfere. Harsh criticism echoed by insiders who acknowledge that the weeds of bureaucracy are choking the potential harvest of public participation. Fallen Fruit creates one of the most powerful forces on earth, community, by engaging people and introducing them to each other, all as they source and map public fruit bounties. Along the way, a neighbor with abundant lemons will met a neighbor with loads of passion fruit and a community walk culminates with a "Public Fruit Jam". Imagine if City Hall were to get beyond the "either/or" approach to the delivery of services and look for synergies. Edible Estates took underutilized and completely unappreciated land and removed the turf, reducing the need for water and fertilizer. The host replaced his lawn with a beautiful garden that became the pride of the neighborhood, producing a bounty that exceeded the needs of his family. Imagine if City Hall looked at underutilized assets as opportunities to invest in the future, not simply as short-sighted fire sale fodder. Urban Homesteaders embarked on a journey that was motivated by a desire for a better life. Along the way they went from making their own bread to growing their own vegetables to raising their own chickens to writing a book on living the sustainable intentional life in an urban environment. For all the talk of municipal sustainability, the Urban Homesteaders have demonstrated that the real opportunity takes place one home at a time, a lesson that should resonate in City Hall as it continues to look for high-altitude solutions to street level problems. Backwards Beekeepers rescue bees and remind us that bees are responsible for pollinating fully one third of California's agricultural output. Misplaced bee swarms are opportunities to find a win-win solution that is good for the bees and great for the community. Imagine if City Hall responded to "buzzing" with an honest and sincere desire to find a win-win solution instead of just limiting public comment and adjourning early. Green Streets is one of LA's best kept secrets, one that will allow us to reclaim water and divert it to bioswales and gardens that will put the water to good use, slowing it down and cleaning it before it finally makes its way to the river and the ocean. Andy Lipkis of Tree People reckons that LA spends a billion dollars getting water and then a half billion dollars getting rid of it. The City of LA could get out of the business of battling over water if it focused on putting its water to good use, an endeavor that would start with green streets and a partnership with local community gardeners. Sustainable Gardening is an opportunity to teach "Mow & Blow" maintenance workers a marketable skill that is environmentally responsible and economically valuable. The City of LA can pass anti-leaf blower ordinances all day long but as long as homeowners maintain "Mow & Blow" turf, nothing will change. City Hall must support green education and set its sights on training urban farmers, not just planting trees. Victory Gardens have generated as much as 40% of America's produce during times of crisis and today's economy should serve as a motivation to revisit the benefits of community gardens. The National Gardening Association estimates that a well-maintained vegetable garden yields a $500 average return per year and a study by Burpee Seeds claims that $50 spent on gardening supplies can multiply into $1,250 worth of produce annually. California's State Capital has a Victory Garden, the White House has a Victory Garden, but LA's City Hall has turned its back on opportunities to embrace the community gardening. 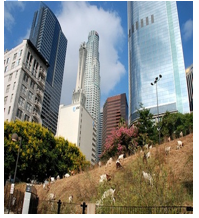 If City Hall were run by Community Gardeners, Los Angeles would take an Urban Farmers approach to Public Safety, Public Health, Public Works, and Public Education. Solutions would last longer than the terms of the officeholders and short sighted plans would find no traction. Most importantly, Los Angeles would look beyond the immediate harvest, nurturing complementary relationships and investing in a long-term commitment to the future for the people of Los Angeles.